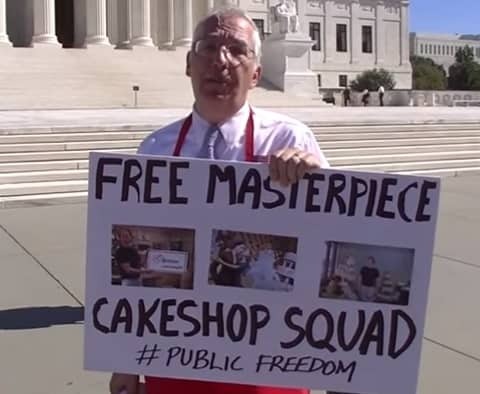 Anti-gay activist group Public Advocate of the United States last Wednesday presented an all-singing all-dancing rally outside the Capitol building in support of anti-LGBT bakers the Masterpiece Cakeshop. The case against Masterpiece Cakeshop – which earlier this year refused service to a gay couple – is due to be heard at the U.S. Supreme Court on December 5th. In a move certain to influence SCOTUS judges, the Free Cake Baker Squad performed “a country parody song CAKEY BREAKY HEART to the tune of Billy Ray Cyrus’s Achy Breaky Heart, do a 2 step line dance and hold signs that say ‘Free The Cake Baker’ to promote the religious liberty of all Christians in the federal case now before the Supreme Court,” said Public Advocate President Eugene Delgaudio. You can tell your friends / Don’t buy a cake from him / And write and post / A bad review on Yelp. ‘Cause if you sue my shop, / My Masterpiece Cakeshop, / I may never bake / Another cake again. Have a look at the stirring rendition below.